We'll, we've got three little kittens that need some names!!! They're the McGillicuddy Girls, or if you prefer, the McG Three. A big thanks to our dear friend, Cynthia, who gave the surname to this little litter. Raffle winners Sarah Proudfit, Robyn King and Kara Dixon will be selecting the first names. Ladies, can you please send an email to kittywrangler(at)gmail(dot)com so I can assign you a kitten to name? The other two raffle winners will be naming a kitten from the next set. I know some may be tempted to shout out a few name suggestions, but please, let's keep those to ourselves for now. If they need our help, I'm sure our winners will let us know. These three little girls aren't so little. In fact, they are pretty close to making weight already. They just need to fatten up a bit, and learn a little etiquette at Ms Butterbean's Kitten Finishing School. I plan to savor every second with these sweeties, and I hope you do the same. We'll be sharing the other two girls tomorrow, and if we know their first names by then, we'll share those too! Ooh a calico cutie, looking like she's fixing to charge full steam ahead at the camera. Can't wait to find out what your real name will be. I just love those fluffy smudges. She is lovely! Congratulations to the lucky person who gets to name her! Oh so pretty! :) And I love the last name. Thank goodness they won scholarships to Ms. Butterbean's Kitten Finishing School. Then they grow up to be confident, loving (and well-groomed!) young lady cats!! Oh what a cutie little McGillicuddly. Oh I mean McGillicuddy. Great name Cynthia S.
Fluffy smudges = fludges? Smuffs? So cute! Precious gal! Her time at the Butterbean Finishing School will be well spent. Well, let's hope one of them is named Lucille. How is every litter more cute than the previous? Just when you think a kitten can't be more adorable! She is adorable! What a face! This little lady looks determined and intent, plus adorably round. Can't wait to hear all about her personality! What a cutie!!! Can't wait to meet the other two! Her comes trouble! Methinks Matron Bean will have her hands full with these young ladies! We LOVE that little itty bitty nose smudge! Adorable! Aww, isn't she a little princess? I have a weakness for the calicoes :) And whoever said McGillicuddly was spot-on. 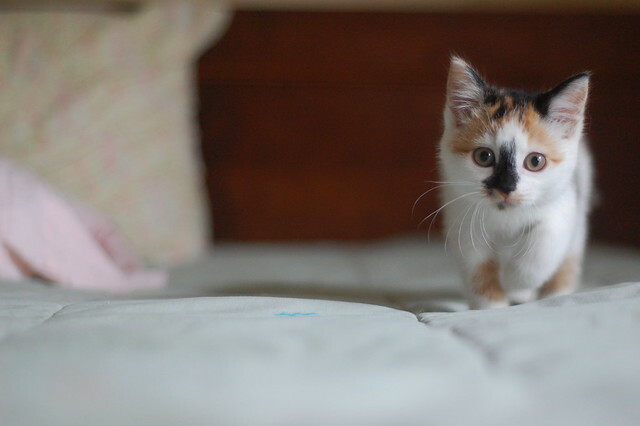 But I realized, thinking about adding a calico to my kitty household - I don't care what color they are. I love them all the same. Like smudges, patches? Too much dog?